A Hard fork, really is a misleading name. It connotes the idea of a train traveling on the tracks and the conductor makes a decision to change the rail switch, and choose a another track to go down. While the trains directions changes, the passengers cargo and train remains the same. Everyone enjoying a happy trip, maybe the destination changes, but nothing else happened. You can imagine who today we think is the conductors of Bitcoin, and who tomorrow some hope will be the new conductors. But in reality Bitcoin is supposed to be a decentralized system, and in those systems, its not a train, but a group of participants with guns drawn at each other. More on that later. In the world of protocols, which Bitcoin is supposed to be, a Hard Fork, is really what a hardware engineer would colloquially call a Rip and Replace, the minute you change one rule that requires a complete network upgrade, you have in fact a new network. Now while the hardware is not changed, the players are the same, the rules of the game have changed and every participant is in effect starting from scratch in a new field. While we have a distinction between Hard and Soft Forks, and Peter Todd does a great job explaining, the difference. I will discuss, why hard forking, which some celebrate as the epitome of bitcoin resilience is pernicious and dangerous in a decentralized network, particularly if the minority simply accepts it. Hard Forks should be a last resort and should be something self-evident to the network. If they are not it is incumbent on the minority to threaten to break the network if needed. Shower thought: Hard Forking a decentralized protocol, means its not very decentralized. In fact Hard Forks, should be practically impossible in Bitcoin, if it is truly a decentralized network. Consider that in a truly decentralized trust-less network , there is no central authority and the participants do not know each other. How can you signal to an entire network it must replace its protocol at a specific date and time? Who would make this signal? Take the debate of encryption on the internet as example. Encryption is many different protocols, which some governments now want backdoor access to. Except there is no possible way they can have access to all systems because encryption technology is decentralized and evolving, there is no way to signal to all participants to accept a specific standard. There is no way to even “hard fork” to one standard encryption protocol even if all the governments of the world somehow wanted to. Doesn’t mean they won’t try, but this is the nature of a truly decentralized system. Hard Forks in decentralized systems cannot be imposed they must emerge. Probability of any Imposed Hard Fork Succeeding is inverse to the level of decentralization of network. Recall the Y2K bug, for those who weren’t around, it was a potential bug embedded in what was an emergent standard (not dicated or set) of how data was stored in computer systems. Computer systems once deployed operate and exist in decentralized global system. In this case there was was a common practice, of using truncated 2 digit years to save space. So that, a document with the date of October 26, 1985, would be stored as 102685. This worked great for about forty years, particularly in the days when space was measured in bytes and kilobytes. Then around 1995, despite it being a known issue in some circles for years earlier, technology professionals began realizing that in the year 2000, some computers would mistakenly read the date of 01-01-00 as January 1st, 1900. On the face of it not the end of the world, but then people began realizing how date systems were anchors to all kinds of functions within programs and computers, and it became apparent it could be catastrophic. There were concerns people could not get paid, social security checks would not be sent, medical benefits revoked, flight control systems in airlines disabled, traffic signaling systems, banking, on and on. Well once again the governments of the world could not really mandate this change although they attempted via laws and committees. Overall because it was in everyone’s self-interest to avoid a computer failure on January 1st 2000, an emergent hard fork occurred, where pretty much every computer system was either updated or replaced, and still many were not. This is an acceptable hard fork, while the Y2K bug in the end was overblown, it was apparent from game theory that it was not an attempt by one party to gain, but all parties where affected equally and possibly fatally. It was truly a once in a life-time, possible do or die, situation that necessitated a hard fork. This should be the standards for Hard Forks, it should be an unknown event because in a decentralized network where all parties are equal it takes an external event or threat of that no one has control over to signal to all parties equally to change. If not one must conclude the network is not decentralized. Above I stated that if a hard fork attempt is made on the network without self evident consensus then in fact the minority needs to view this as an attack of the network and now has a choice to make. Consider a simple consensus network of 3 parties. All Parties are in equal position of relative power as they perceive it. The parties are not identical however their benefit received from the network is. Party B now determines that if they can change one rule in the system they can receive Reward Br+1, thereby improving their results and those of C, even though they believe it may not benefit party A. Party A view the change as Ar-1, thereby a loss to them. Party C views the change as Cr+1, indicating that they will work with B to override A. Clearly B and C were correct to engage, even at the expense of A, they benefit, and the network may benefit, assuming their calculations are correct. Party A has the choice to accept the change, or exit the network. Party A’s only ability to stop the attack is to either affect the value of B and C’s Reward to where one of the attacking party perceives it will be a net loss if it continues. Additionally consider that parties B and C will signal that no matter what A does they expect to be victorious. Although no party in fact knows how one will act and what the result will be until after the process is complete. The reason this is legitimate is because all three parties entered the system to play by the same rules, by B and C changing the rules, a new system emerges, A must now choose to stay, exit or signal to B and C that they are wrong and A must show B and C how their assumptions are incorrect. If Bitcoin permits a Hard Fork of the network, and if a majority can hard fork the network against the wishes of the minority then what is happening is that Majority has effectively discovered a loop hole in the consensus rules and is engaging in a network attack to reward itself from the benefits of the attack. Regardless of how altruistic B claims their intent is, regardless of whether B believes that their solution will bring peace on earth, and caviar dreams and limousines to all, one has to assume in a decentralized system that all participants act out of self interest first, and if one party sees no reason for a consensus rule change and the other party does then more than likely the majority party is looking to increase its benefit at the expense of the minority. Any result where the minority cedes to the attackers concludes the network is centralized because either A concedes and remains in the network thereby signaling that in fact B and C own the network and will manage future changes to their benefits, or A exits the network which has the same result in centralizing the network to B and C. Only by A successfully signaling that the attack will result in a loss for all can the network be restored to a decentralized state. 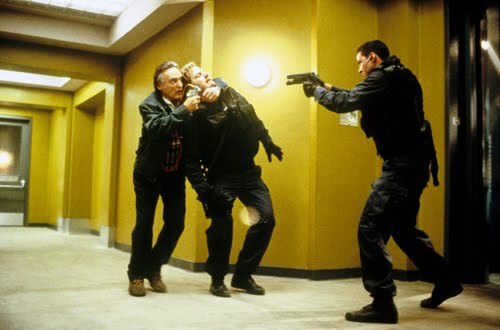 In the 1990 cult classic movie Speed with Keanu Reeves and Sandra Bullock, the movie deals with a villain, played by the late Dennis Hopper, who masterminds No-Win scenarios, in a game of wits against Keanu’s character a Swat Officer called Jack. Jack must figure out how to catch the villain while escaping his traps, disarming his bombs and not killing civilians in the process. In the famous scene above, Jack in order to stop the villain from taking his partner hostage uses the unconventional tactic of shooting the hostage (his partner) in the knee. Partner:     All right. Pop quiz. The airport. Gunman with one hostage. He's using her for cover. He's almost to a plane. Take her out of the equation. You're deeply nuts. You know that? As Hollywood as the scenario is, it is a legitimate game theory option. This is asymmetric warfare, where the opposing force’s only chance of success is to communicate to the larger force that it will pursue unconventional tactics, that were likely not part of the large forces calculations. This can then bring into question if the successful attack of the larger force will provide the results it seeks. Similarly those who oppose the hard fork maybe forced to signal to the attacking party that they may attempt different techniques which could undermine the overall results, the hostage in this case Bitcoin. Some would be horrified at this discussion and indeed it is being discussed on reddit. But the reality is in a decentralized network, all participants are free to play by any rules within the consensus, and if they can change it to their benefit than the consensus rules were not properly balanced or decentralization never existed. One scenario discussed in reddit, is forking to an alternate PoW with all the pending hard fork changes proposed by Core, thereby giving the market 2 clear choices, a 2mb increase via contentious fork, versus a coin that has serious improvements on the bitcoin protocol with a PoW that locks out all existing hardware, while this would lock out hundreds of millions in hashing investment, it opens the possibility of capturing wasted hashing locked away in worth-less altcoins and because it is forking as a last resort, a nuclear option, the only reason a hard fork should ever be attempted, it may signal to the overall market that this new coin is the more decentralized alternative. The fact is, that the market has incorrectly assumed that core development is a centralizing force for not implementing a hard fork, and in fact it is not. Core Development correctly concluded that Hard Forking a protocol, without the hard fork being emergent and self evident, would be an act of centralization with the potential to break bitcoin, so they did not do it. Additionally, others have mistakenly perceived Core’s inaction as centralization, and are now themselves acting in manner to centralize the network by imposing a consensus change to the network without actual consensus. Again, unless a self-evident, consensus emerges, the “Oh my god a Giant Metor is Coming”, there is no reason to hard fork an operational consensus protocol. And as such the minority power has every right to pursue all options as much as the majority power. Now I am not advocating deliberate sabotage, or anything illegal, nor am I spitting sour grapes. But I do believe that in a decentralized system like Bitcoin that decentralization must be maintained at all costs and it is up to each participant to defend that, any party which is acting to exert influence on the others outside of the consensus rules is in fact attacking the network regardless of hashing power. To the extent that people view core development as a centralizing force they have every right to decentralize from them, notice however that core never imposed anything on the network it merely played by the already existing consensus rules. With each successful hard fork of the network, one has to assume that either independent miners or full nodes have been lost, or combination of both or the network is centralizing on some sort of signaling. Typically the signal being that with each successful contentious fork the winning hashing power will be emboldened to continue attacking the network in successive self-reinforcing victories. Hard Forks, in effect break the rules of the protocol, it invalidates all previous game decisions made by participants, and in effect creates a new network, with the reality that it is just a matter of time before the rules are invalidated again. Now someone would call this anti-fragile but this is wrong this is run away centralization, and in fact will lead to an inevitable black swan event. Because, the resiliency of the network the counter balance is being attacked and chipped away to accrue benefits to majority, while they are blind to the ever increasing danger of centralization. This does not even take into account the negative signals to outside forces of seeing what is supposed to be a decentralized censorship-resistant protocol in fact centralizing and ejecting elements out of the system in pursuit of non-participant actors. One of the biggest sponsors of a contentious hard fork is in fact an entity that shouldn’t even exist in a Bitcoin, Coinbase. The fact is if that if the majority of keys where held by independent parties with at least some running full nodes, and bitcoin mining was not 10 guys in a room, contentious hard forks would be impossible to coordinate. Now Hard Forks would clearly have less risk again, if they did not have a centralizing effect, or they where a net neutral, i.e. to address a catastrophic bug, a protocol flaw. However those would still come with potential new changes and unintended consequences, but they are pursued when the alternative is typically fatal to the network. The 1mB limit as stupid and arbitrary as it may be is not a flaw, it does not break bitcoin, and in fact blocksize is inherent to bitcoin, since it was imposed by Satoshi on the network, so one cannot say that a catastrophe has been avoided by doubling a number. As we previously discussed in a Dangerous Path Ahead, nothing good will come from this contentious hard fork of Bitcoin, and the laughable 2mb increase may come at irreparable harm to bitcoin and its claims to be a decentralized censorship-resistant currency. You didn’t consider the one case where group A doesn’t realize that by not forking it sends a negative signal to the market that the protocol can never get better and is doomed to be suffocated by its own rules, speculator money bails out as well as investments and everyone moves to the next best crypto currency and then all groups A B and C coins are worth 1/100 of what they are today. The author did consider and go over that quite thoroughly when s/he discussed catastrophic events and emergent changes to protocols (where the change is the the interests of all participants of the system). He then went on and elaborated his thesis “Why a Hard Fork should be fought” and its relevance to game theory. This guy really gets it. Thanks for eli5’ing this for me. I knew there was a problem with this hard fork proposal, but was unable to articulate it. Superb article! Very unique insights into decentralized systems that I haven’t seen written down elsewhere before. > With each successful hard fork of the network, one has to assume that either independent miners or full nodes have been lost, or combination of both or the network is centralizing on some sort of signaling. Don’t forget an extremely important group: the developers of the software itself. XT was a hard fork to instant centralization. IвЂ™ve read several good stuff here. Definitely worth bookmarking for revisiting. I surprise how much effort you put to make such a great informative site. I have no problem with centralization. The problem I have with some kinds of centralization is that they make an otherwise good system vulnerable to coercion. Most kinds of centralization have this problem, so decentralization is a good thing. However, there are some kinds of centralization that do not have this problem, and I like them. There are effects of changes that I don’t like, and some of those changes involve the kind of centralization that I like. In those cases, I like the centralization effects of the changes, but I don’t like some of the other effects of the changes. A hard fork is a good example of a change that involves the kind of centralization that I like, but which can also have effects that I don’t like. A hard fork to a larger block size has no effects that bother me. It does not make anyone’s coins unspendable. It does not make anyone more vulnerable to coercion. It does not encourage or protect deception. Yes, that’s messy. That’s how life is. I believe there is a book about abstractions that points to the danger in making abstractions about abstractions. I think the scary thing about decentralization is scary because we are making abstractions about abstractions. Decentralization is a many-faceted thing, and its facets are not all good or all bad. Economies work because trade tends to centralize (that’s how marketplaces, or agoras, come into existence). That, like everything, has good and bad effects. I think it’s a mistake to be fully against or fully in favor of something as multifaceted as centralization or its opposite.